Let it be clear that at Sandra’s shop, the final touch up with an iron is to be considered a trade mark. Automation is more than welcome as it simplifies many productive processes, yet it is to be remembered that the Lavanderia Sandra lab was born from an artisan tradition deeply rooted in the history of this territory. The shop is now servicing twenty businesses from Florence and nearby areas. 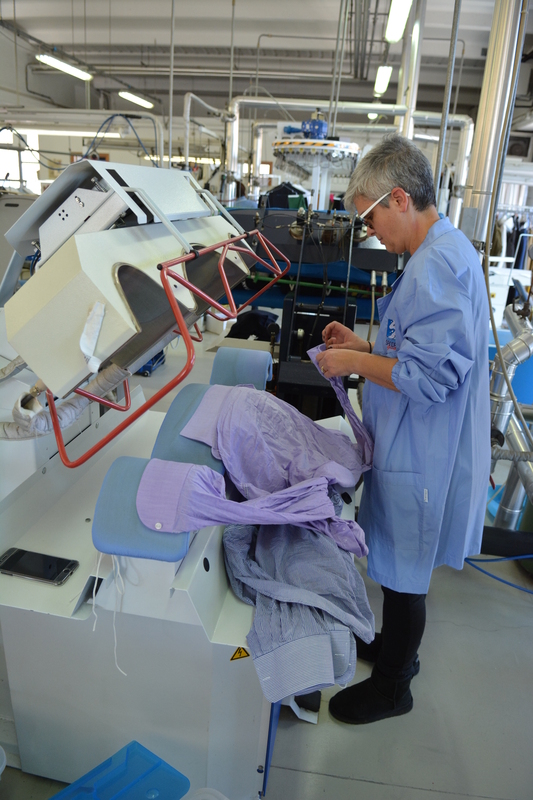 “Therefore, you can be sure that while operating an ironing machine, our operators are ready to intervene manually every time there is a collar to touch up or trousers crease to finish up – confirms Luca Gambassi trying to sweeten his strong Tuscan accent. – Otherwise, what sense would it make to work in Grassina? Here, it is enough to be fifty years old to remember that every spring, our green fields bloomed with primroses and hundreds of bed sheets hanging to dry after having been taken care of by the famous local laundry women”. Luca Gambassi is a son-in-law of Mrs. Sandra Pampaloni who in 1974 took over a laundry shop in Grassina, a small town with fifteen thousand inhabitants in the province of Florence. Crowned with Chianti grapevine and cut by streams, the town remembers how over the many centuries local laundry women would pass their craft from generation to generation by coming to the Ema stream’s pebbly shore to wash rich Florentines’ garments and linen. The “cleaning artisans” were trusted to have the linen come back new again every time. “We can see how, even if my mother-in-law’s husband, Fabrizio, worked as a butcher and in his family there had never been any laundry women, my mother-in-law invested her savings in the activity. She surely knew she would not be wrong” Gambassi says. He has been working there since 1999, when he was still a fiancè of Sandra’s daughter, Monica Arnetoli. Monica works in the family business with her brother Simone and her father Fabrizio who, in the meantime, stopped fixing quarters of a cow on the hooks. Supported by the family and by the professionality of the employees, Mrs. Pampaloni’s idea had been so successful that it easily got exported out of Grassina, until it reached all the businesses the lab is servicing today. As we can see it now, over the last 45 years, the Lavanderia Sandra has become a blooming trade mark following the best Made in Italy tradition inspired by “Small is Beautiful” that refers both to small lovely towns in Chianti area such as Grassina, Tavarnuzze or Scolivigne and to businesses operating in these places. “We need to clarify that the activity has grown well because we made precise choices at the very beginning – Luca Gambassi explains. – One of the choices refers to work. 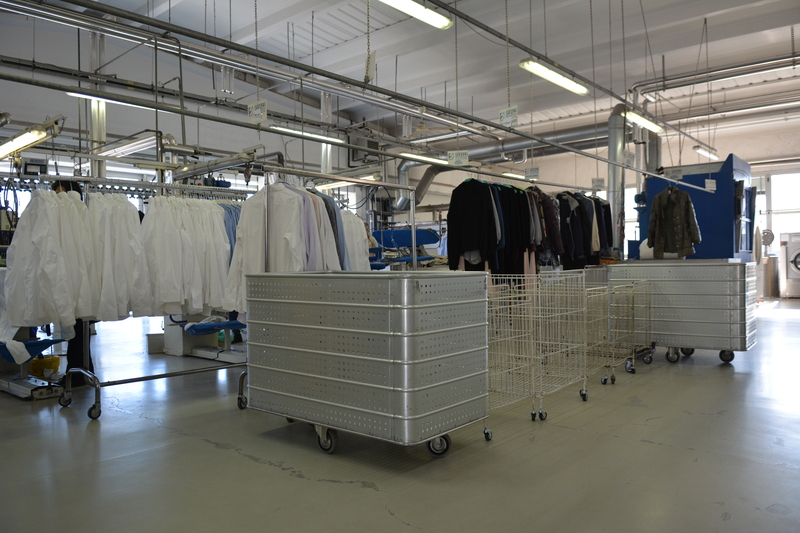 The Lavanderia Sandra personnel believe that work should be done following the rules of the best artisan practice, therefore we pay a lot of attention and dedicate a lot of care to every single garment. It also means that we do not turn anything down. We wash, apart from garments, antique, precious carpets, we treat bags and offer a seasonal storage for prestigious garments”. “As a consequence, as far as the price goes, – Mrs. Pampaloni’s son-in-law continues – we know how to become adequate in terms of clients’ demand yet, without devaluating anything. With all due respect to our competitors, it is worth mentioning that who comes to our shop has a right to a different treatment than what a shopping mall dry-cleaning shop can offer, where everything turns around a mono price policy”. 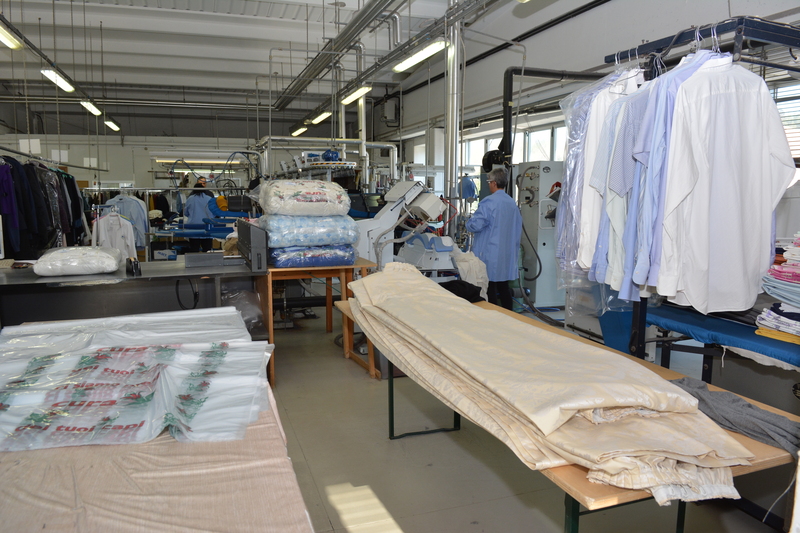 The company policy allowed the Lavanderia Sandra to become a supplying point of reference to many fashion producers of the great Tuscan tradition. 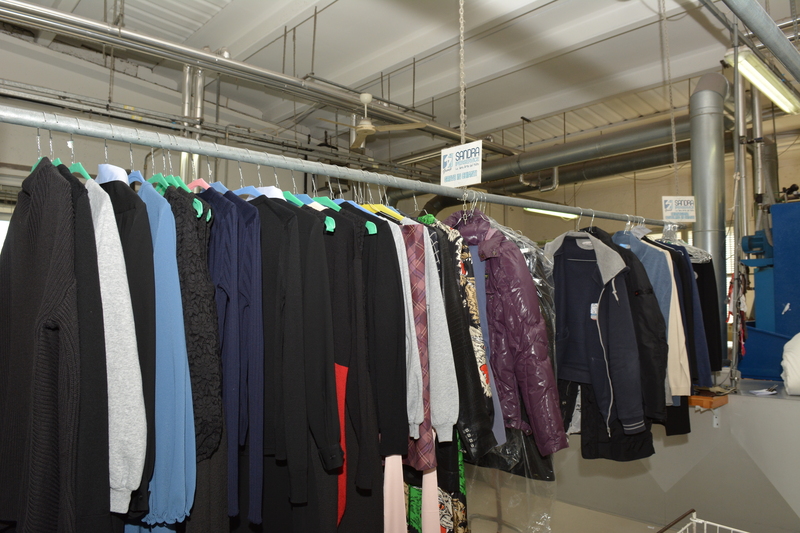 “We clean their workwear – explains Mrs. Pampaloni’s son-in-law – but clearly, the base of the trust makes them mention our name to their clients if they look for a dry-cleaner to wash their ten thousand worth winter coat”. The artisan vocation is combined with industrial machines distributed in a 450-sq. 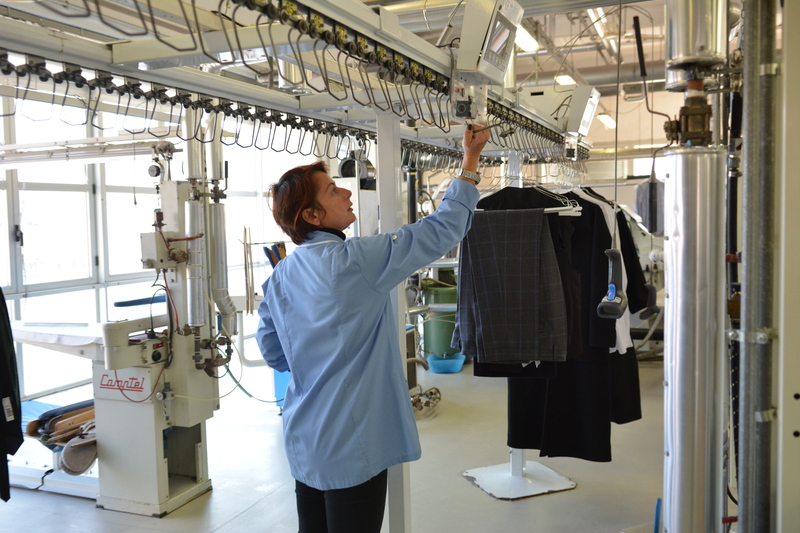 m. lab: two dry-cleaning machines, four washers, two dryers, five ironing stations, two presses and two toppers. On the other hand, we could expect that from the land where primroses and bed sheets “bloom” every year in the spring time.